Recall of Certain Frozen Organic Dark Sweet Pitted Cherry Products Due to Possible Contamination by Listeria monocytogenes | SunOpta, Inc.
TORONTO--(BUSINESS WIRE)-- Out of an abundance of caution, SunOpta Inc.'s subsidiary, Sunrise Growers Inc., has issued a voluntary recall of certain frozen organic dark sweet pitted cherry products due to the potential to be contaminated with Listeria monocytogenes, an organism which can cause serious and sometimes fatal infections in young children, frail or elderly people, and others with weakened immune systems. Although healthy individuals may suffer only short-term symptoms such as high fever, severe headache, stiffness, nausea, abdominal pain and diarrhea, listeria infection can cause miscarriages and stillbirths among pregnant women. This recall includes certain frozen organic dark sweet pitted cherry products distributed from Sunrise Growers' facility in Edwardsville, Kansas on August 10, 2017. The issue was discovered during routine testing by Sunrise Growers. No illnesses related to the consumption of these products have been reported. 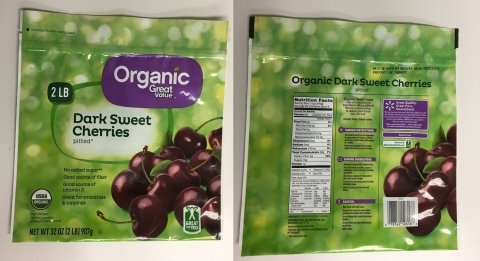 Ninety cases of Great Value Organic Dark Sweet Pitted Cherry products are being recalled. The products are packaged in 32 ounce printed plastic zip top bags and marked with a Best By Date of 08/10/19 on the back of the bag. The UPC code is 078742126166 and the lot code is FED722211 or FED722212. These recalled products were distributed to a customer distribution center in Louisiana and may have been redistributed to stores in Louisiana and Mississippi. The affected retail customer has been notified of this recall and instructed to remove any recalled product from retail store shelves and inventories. Consumers are urged not to consume these products. Consumers who purchased these products may take them back to the store where they purchased them for a refund or simply discard them. Consumers seeking information may email contactus@sunopta.com or call 1-800-854-1988 Monday through Friday, 8:00 a.m. to 5:00 p.m. pacific time.